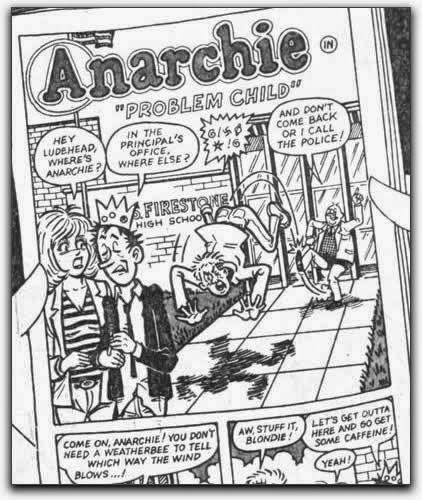 I’m not sure when I first heard of Anarchy Comics, but I’m guessing it was sometime between 1994 and 1996—that is, during the period when I was reading a lot of comics and books on anarchism and during the period when there was no internet. Had I had internet access, I would have tracked down an issue or two, or at least have learned something more of its existence. It was anarchism in comic book form, after all. The 17-year old me would not only have loved reading such a book, he would have needed to read it. But alas, I never got my hands on a single copy. And then I graduated from a fascination with anarchism into ironic political detachment. That is, I became a political sociologist. But things get collected and reprinted. Many months back, I was at the store to buy our beloved editor a birthday gift when I saw the Anarchy Comics trade. I read it immediately. I planned to review it immediately. And then I procrastinated and got out of blogging for a few weeks—or something along those lines. Here it is, six or so months later and I've finally got around to it. The review: It’s worth your money. Yes, yes. Irony. 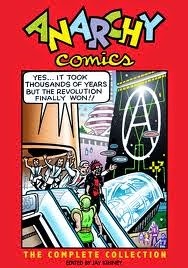 Editor Jay Kinney came up with the idea of Anarchy Comics in the late seventies, in part to join his passion for comics with his passion for anarchist philosophy, in part as a way to make sense of the unceremonious demise of the New Left on the world stage. And it reads like the late seventies, full of punk vigor and utter disdain for the right and the left. Though it’s a relic of its time, it is nonetheless a very important and very entertaining piece of comics history. It’s often pretty funny too. Kinney deserves praise not merely for corralling an international gang of cartoonists into contributing to the book, but for his own contributions. He and Paul Mavrides created some of the best and funniest strips in Anarchy. “Kultur Documents,” a bizarre mélange of a pictogram workers rebellion and a punk spoof on Archie Comics—seriously—is perhaps the best piece in the collection, sardonic and bizarre. “Armageddon Outtahere” may also possibly be the best piece in the collection for the very same reasons, with the added bonus of pondering competing claims to ownership of the apocalypse. These two alone may be worth the price of the book. 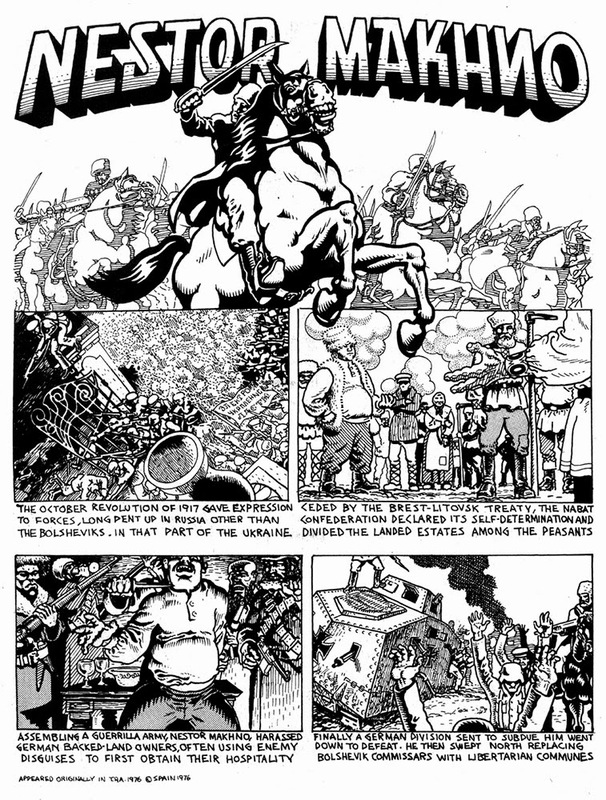 Among Anarchy Comics’ better entries are its historical strips. The French duo Épistoloer and Volny provide a number of historical sketches of anarchism, examining the Kronstadt Mutiny following the Bolshevik Revolution and the Rustauds’ Revolt in 16th Century Alsace. Another piece Steve Stiles’s “Wobblies!”, meshes the history of the American IWW union with his own experience of questioning at the hands of US military intelligence. Unsurprisingly, Spain Rodriguez provides the best of the historical strips with his pair of entries on the Spanish Civil War, “Blood and Sky” and “Durruti”; a brief biographical sketch fn Ukrainian anarchist Nestor Makhno, and “1871,” a look at the failed Paris Commune. (His “Roman Spring,” exploring the generational conflicts of the Italian “Years of Lead” during the 1970s, unfortunately, is rather superficial and romanticized story, heavy on melodrama.) Reading these made me wish he’d have continued with such historical work on anarchism—and maybe I should finally buy Che. But as with most anthologies of any kind, some of the material in Anarchy Comics is forgettable. Much of this reads like the writings of unfocused youthful agitators: willfully naïve and childishly hostile, overflowing with equal parts optimism and anger. And ultimately pointless—as editor Kinney admits, to an extent, in his introduction. From a pedagogical perspective, more thoughtful pieces on anarchist philosophy and its development would have improved the book considerably. Though Anarchy Comics was designed to specifically avoid long-winded exegeses on obscure tracts and sterile debates over irrelevant minutiae of good theory—a hallmark of leftism—such materials would have been beneficial for the novice militant. The collection does include a handful of terse theoretical pieces—Harry S. Robins’s “Anarchy Panarchy” being the best, as well as funniest—though I would have preferred more. I suppose I’ll have to make a trip to the library. Part of anarchism’s allure—and part of the reason for why it has historically been seen as such a threat—stems from its association with violence, i.e. the propaganda by the deed. Marx derided his anarchist adversaries as “alchemists of revolution”: they believed, he argued, that they could jumpstart revolution through daring acts of violence and assassination, thus avoiding all the work of raising consciousnesses and patient mobilization. Anarchy Comics certainly has its fair share of appeals to violence, often adolescently expressed. While violence in comics may be commonplace, enjoining readers to perpetrate the mayhem themselves is often frowned upon. And it’s hard to imagine anyone getting away with a fictional account of the president’s assassination in this post-9/11 world. But it was a simpler time. Well, it’s late and I have class to teach early in the morning. Plus, I’d like to get in a few pages of Bakunin before bed. Maybe there’s something to this anarchist business after all.